Held at Cypress baseball field in Irvine, California, players, family and friends should arrive at 09:00. The first of two baseball games will begin at 10:00. All money raised will go directly to the Michael J Fox Foundation. Support Oliver and Terry Holler in the DeLorean Time Machine – that they built themselves – to travel across the US and raise funds for The Michael J Fox Foundation. Join car enthusiasts at Captain’s Quarters Restaurant in Prospect and celebrate the love of cars over coffee and breakfast. There is a $5.00 entry fee per car, with donations collected benefitting The Michael J Fox Foundation. Both depression and apathy are common in Parkinson’s disease. Learn about these commonly misunderstood Parkinson’s symptoms by joining a one­-hour online seminar led by Dr Dawn Bowers, Professor of Neuropsychology, University of Florida. Enter the cycling challenge to climb the three main mountain tracks – Bédoin, Malaucène and Sault – in just one day and raise money for Parkinson’s research. 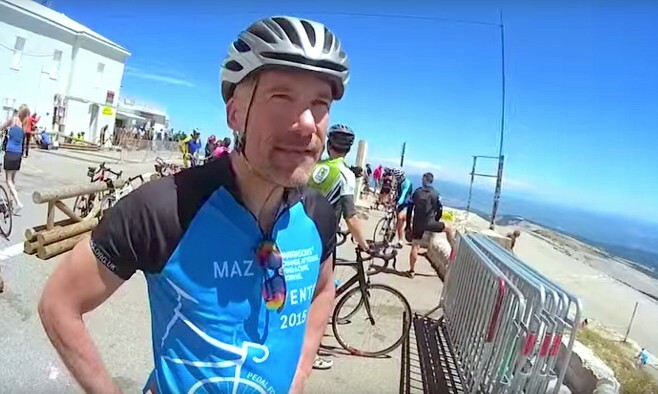 Successful cyclists become members of Club des ‘Cinglés du Mont-Ventoux’ – ‘The Mont Ventoux Madman Club’. Learn about the latest research findings and state-of-the-art treatment options in Parkinson’s disease and other movement disorders. More than 5,000 medical professionals from around 86 countries will be able to view over 2,200 scientific abstracts submitted by clinicians from around the world. Parkinson’s UK and the Rotary Club of South Queensferry join forces to raise money for Parkinson’s causes by offering the chance to abseil, SAS style, down 165ft the iconic Forth Rail Bridge onto the beach below. No experience is necessary and you will receive safe and expert guidance throughout from the Glasgow Climbing Centre Team. Join Professor Stephanie Cragg as she discusses how this project could bring new insights into how dopamine-producing nerve cells work, and what happens to them in Parkinson’s disease. A memorial service will be held for Sir Richard Nichols, who was the co-founder of The Cure Parkinson’s Trust. The service will take place at St Giles Cripplegate Church, London, with a Choral Evensong at 17:00. A reception will be held afterwards at Salters’ Hall.